Like a lot of people, I was dismayed to hear that the Huntington would open its current season with an adaptation of Guess Who's Coming to Dinner, the plodding, preachy Stanley Kramer melodrama from 1967, which broached the first positive Hollywood portrayal of interracial marriage to a public that was still absorbing Loving v. Virginia (the Supreme Court decision which made such unions legal across the country). Of course Guess was a landmark in its day (it also showcased the poignant final pairing of Katharine Hepburn and Spencer Tracy, who passed away only days after shooting wrapped). But how, I wondered aloud, could it still speak to the veiled prejudice of Fox News and the Tea Party, much less the racist police state recently revealed in Ferguson, MO? 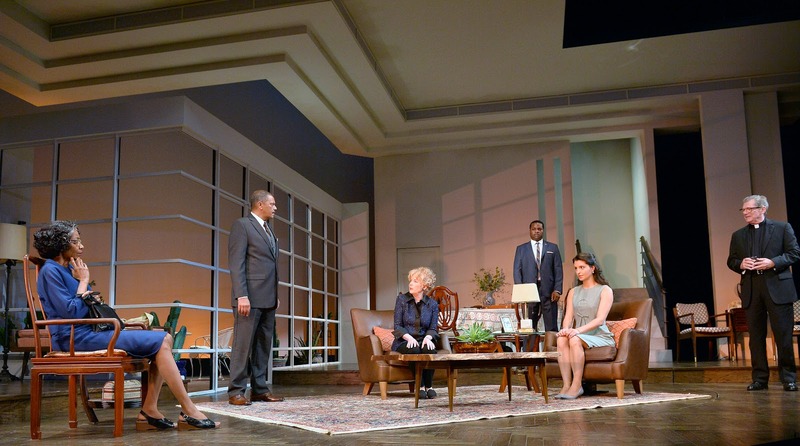 To me, the script (adapted by Todd Kreidler from William Rose's screenplay) sounded like a dated pretext for what amounted to yet another Boston-to-Broadway launch (so I wasn't shocked to hear that TV stars Malcolm-Jamal Warner and Julia Duffy had been signed for major roles). But surprise, surprise; it turns out the play isn't so very dated after all (it closes this weekend, btw). Its challenge to many white liberals (it all but whispers, "Yes, but would you want your daughter to marry a black man - even if he's Sidney Poitier?") still has a ring, or at least an echo, of truth. The current hilarity filling the Huntington (remember laughter is often triggered by anxiety) tells you that much in a heartbeat. Which is rather depressing, to be honest - even though this production proves beguiling, and evinces a showbizzy style that eluded Stanley Kramer (it helps that adaptor Kreidler has honed the comic edge of the material, and given the script a slight spritz). So the Huntington wasn't entirely wrong to program this show. But what the theatre - along with its talented cast, and director David Esbjornson - has not done is answer the unexpected, but suddenly salient, questions raised by their own bet on the material. But the Huntington production can't seem to make up its mind on these questions (actually, it tries to have everything both ways at once), which leads to an underlying conceptual vagueness that slightly compromises the deft craft of the performances and staging. Julia Duffy and Will Lyman make the Hepburn and Tracy roles their own. Indeed, the set alone tells you the production hasn't made up its mind about a lot of things. Designer Dane Laffrey channels the film's white-on-white interiors - dotted here and there, tellingly, with American antiques - but gives the San Francisco penthouse of the Draytons (the play's liberal power couple) a stripped-down, Silicon-Valley edge - which half-puts us in the millennium (but only half). A more convincing nod to the urge to update is the casting of Malcolm-Jamal Warner as the accomplished doctor poised to marry the Draytons' daughter, if they'll give their blessing; replacing the divinely distant Sidney Poitier with the warmly familiar Theo of The Cosby Show (once the most popular program among whites in South Africa!) was, to be honest, a casting coup overlaid with too many ironies to count. Still, the production makes one curious (but serious) mistake: it bungles the role of the Draytons' daughter, Joanna. In the film, she was a sweet but blank innocent; she might have stepped out of Star Trek, she was so trusting in liberal formula. Here, however, Joanna has been remodeled (in this theatre's familiar way) as a confident professional woman - which goes peculiarly wrong, as it makes the way she pushes people around crudely manipulative, if not outright cruel (and alas, the talented Meredith Forlenza can't figure a way out of her character's resulting unlikability). Unfortunately, this alone throws much of Guess Who slightly askew. It may be ironic to note that its anti-racist message partly depends on the sexist conception of a central character - but I have a hunch that's just the way it is. So there's some conceptual fog floating over this San Francisco penthouse - still, several of the performances here burn through it. Warner acquits himself rather well, actually, even if he does occasionally slip back into a few Theo-isms. 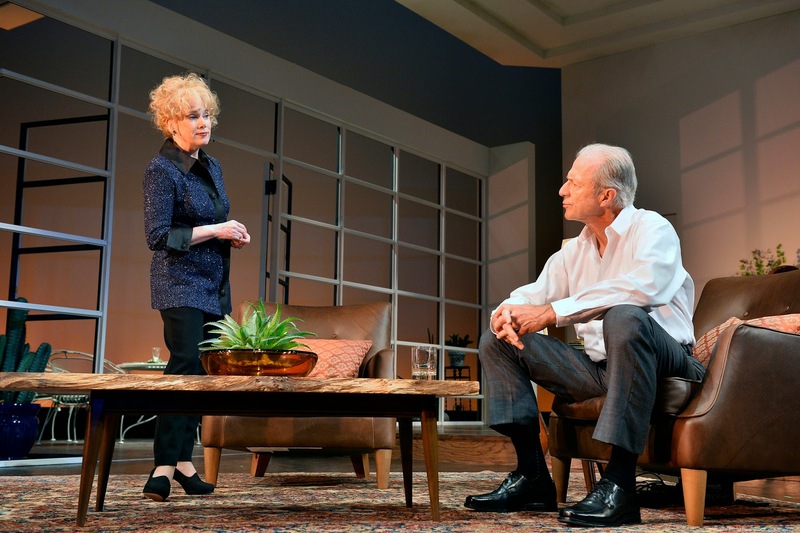 But it's Julia Duffy and Will Lyman who steal the show. Duffy is exquisitely poised, and manages more complexity (if not more force) than Hepburn ever did; meanwhile Lyman does some of his subtlest work in years, and brings a light touch to much of what seemed stodgy in Spencer Tracy's hands. And they're matched (or more than matched) by Adriane Lenox and (particularly) Lonnie Farmer as the Draytons' in-laws-to-be, the Prentices, who have their own views about their son's prospective marriage from the other side of the color bar. (This luminous pair get the best stretches of the script - and they seem to know it.) Elsewhere there's an expert turn from Lynda Gravátt in the tricky role of the Drayton's housekeeper, that's unfortunately balanced by a surprisingly hammy one from reliable local star Patrick Shea as an Irish monsignor who's stock in every way except his politics. Still, this isn't enough to derail the rest of the play - it only hammers a few clichés home with too much force. So in the end, you leave this production liking it, despite its occasional fumbles - and even though it elides the pressing racial issues of the moment (just as the original film ignored the smoke still lingering from Watts). I admit there's still a place for Guess Who's Coming to Dinner at our cultural table. But that sad fact only argues that the Huntington should be serving up more challenging fare as well.